The furthest thrown flying object in the world!For exhilarating games of catch, nothing compares with the Aerobie Pro flying ring, holder of the Guinness World Record for the farthest throw – it flew an amazing 1,333 feet / 406 meters. For truly exhilarating games of catch, the Pro ring has no equals. You can actually play catch with a friend more than 100 yards away. The soft rubber edge makes catching soft and easy. 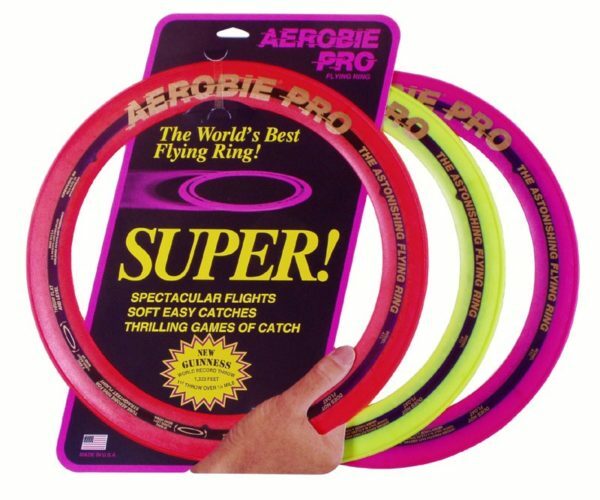 Even today, more than a decade after the Pro ring’s creation, onlookers are still amazed by this incredible flying ring. Size: 13 inch diameter. Available in orange, yellow, and magenta. Ages 12 and up. Quality made in the U.S.A.